These maps were created by Benjamin M. Schmidt, an assistant professor of history at Northeastern University and a researcher in the digital humanities. 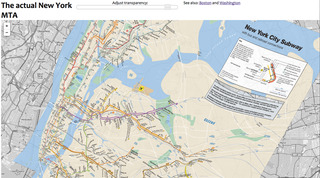 Check out the interactive version at his website, where you can adjust the transparency of the overlaid map while zooming in and out. I've seen geographically accurate subway maps before, but this particular presentation of a familiar map, all scrunched up, made obvious the difference between a city's dense inner core and the larger metro region. Large subway systems serve two almost distinct functions: short rides to get people on foot from one neighborhood to the next, and long rides reaching out into the suburbs where the stations all have parking. As you ride out to the end of a subway line, the stops become further and further apart, the riders fewer and fewer.